Figure 2 MIP reconstructed from the source images of a T2-weighted multislice HASTE sequence in a male patient with chronic infravesical obstruction and bilateral ureterohydrone-phrosis. Abbreviations: HASTE, half-Fourier acquisition single-shot turbo spin-echo; MIP, maximum intensity projection. 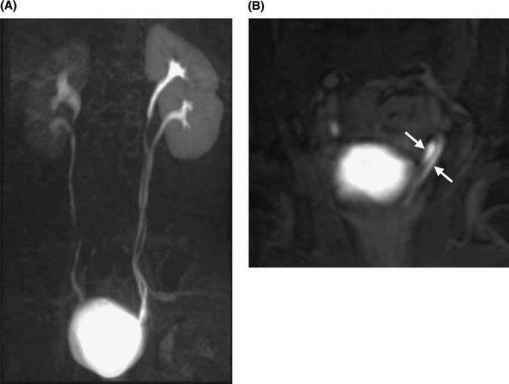 the gadolinium-enhanced technique achieves detailed MR urograms of nondilated and moderately obstructed urinary tracts, provided the renal excretory function is not severely impaired (2,4,19-31). 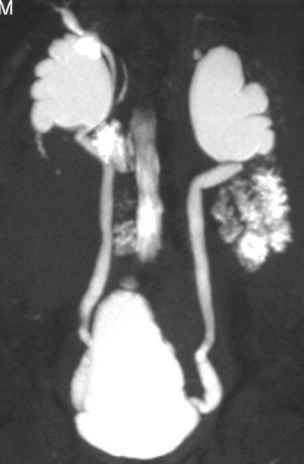 Conversely, excretory MR urography is of no use in marked hydronephrosis associated with renal insufficiency. An intravenous dose of 0.1 mmol/kg of bodyweight (kg-bw) of gadolinium is generally regarded the standard dose in clinical MR imaging and commonly recommended also for the use in excretory MR urography. Low-molecular weight gadolinium chelates eliminated by renal excretion are commercially available and have demonstrated a good safety profile, including a low nephrotoxicity at standard dose (32-35).